Welcome Home Series handlesets are the perfect addition to your front door to create a unique and fashionable entryway to your home. Each is stylishly designed to provide maximum-security protection. There are many styles, finishes and configurations from which to choose. Heritages stylish arched shape accented by graceful beveled lines emanate exquisite sophistication. Single Cylinder Handle Set Exquisite design combined with a distinctive profile, the Troy knob executes strength and beauty The Venetian Bronze finish is hand-rubbed to reveal unique bronze highlights and provides a rich and warm complement to the product's style. Collections by Weiser offers five handlesets to choose from. These handlesets offer solid forged brass construction and Grade 1 cylinders for uncompromised security. Grayson's clean flowing lines and smooth, windswept curves add just the right touch of coastal charm. Single Cylinder Handle Set Exquisite design combined with a distinctive profile, Trapani's fashionable wave silhouette design is the perfect complement to homes with inspired style. The Elements Series<sup></sup> provides an expanded choice in Fashion Doorware at an affordable price. In decorating your home, choosing the right paint, wallpaper, tile and trim is important in creating a personal design. The Elements Series<sup></sup> of Fashion Doorware will support and enhance your decorating decisions. 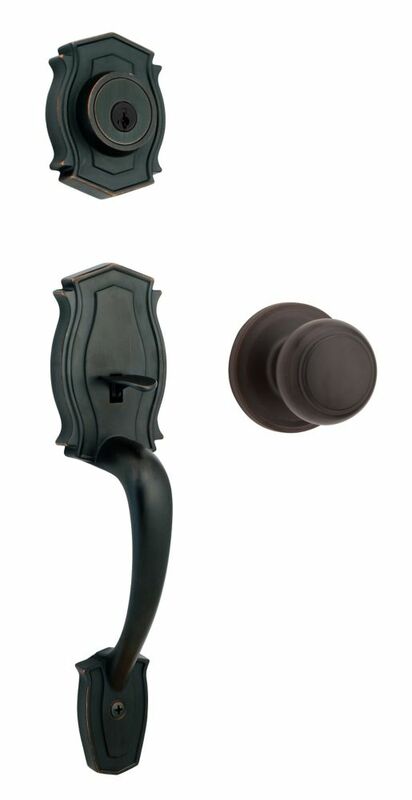 Heritage Single Cylinder Venetian Bronze Handle Set with Troy Knob Welcome Home Series handlesets are the perfect addition to your front door to create a unique and fashionable entryway to your home. Each is stylishly designed to provide maximum-security protection. There are many styles, finishes and configurations from which to choose. Heritages stylish arched shape accented by graceful beveled lines emanate exquisite sophistication. Single Cylinder Handle Set Exquisite design combined with a distinctive profile, the Troy knob executes strength and beauty The Venetian Bronze finish is hand-rubbed to reveal unique bronze highlights and provides a rich and warm complement to the product's style.